Fibromyalgia Awareness | Troy C. Wagstaff aka CallahanWriter Blog: Topics of interest include Western Historical (1865-1899) Topics. Additionally inspirational Christian and Fibromyalgia interests. 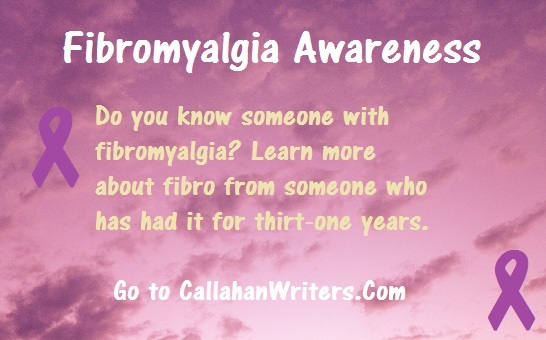 I have had Fibromyalgia for thirty-one years. My Fibro has been officially diagnosed for eleven years. I have learned a lot about the illness. Two things I know about the disease are that other fibro patients want validation and they want to know they are not alone. By adding a Fibromyalgia – Fibro Awareness thread to my Blog I can help with those issues. Doing so will add another important community to the Fibro world. Check back to CallahanWriter.com often. My goal is to post two or three Fibro related Blog posts a week. Share these Fibro posts with other fibro patients. Perhaps these posts will help others. I’m listing three posts to fibro awareness posts that I am particularly proud of or are posts that have more likes or feedback that others. I hope you’ll like them as well. It used to be that many unintelligent doctors called Fibromyalgia a “trash-can diagnosis.” That was very insulting to me and many of my Fibro friends. It now seems most doctors acknowledge Fibromyalgia. Now the issue with Fibromyalgia is to educate people to know that Fibromyalgia is much more than just a chronic pain illness. There are so many more symptoms to Fibro than just chronic bone crushing pain. The way Fibromyalgia effects my daily life can be summed up with two words, freedom and reliability. Having Fibromyalgia is like putting an innocent person in shackles and taking him to jail. Except you don’t take off the shackles. His freedom is taken away. He can barely move around in the small six by eight-foot jail cell.